The SDM8X50 is a 50 ohm, coaxial, 8:1 multiplexer used in a Campbell Scientific time-domain reflectometer system. It consists of a surge-protected multiplexer circuit board enclosed in a metal housing and a separate strain-relief bracket for the coaxial cables. Both the multiplexer housing and strain relief bracket have holes drilled at a 1 in. spacing. This enables you to mount the SDM8X50 to a wall or attach it to the backplate of a user-supplied enclosure or Campbell Scientific enclosure. When you purchase the SDM8X50 with the –E option, a 10 x 12 x 4.5 in. environmental enclosure and enclosure supply kit are included. Other compatible Campbell Scientific enclosures that you may purchase separately include the ENCTDR100, ENC12/14, ENC14/16, and ENC16/18. 21X (retired) Although compatible with the SDM8X50, this data logger is not compatible with the TDR100. CR10 (retired) Although compatible with the SDM8X50, this data logger is not compatible with the TDR100. When purchased with the –E option, a 10 x 12 x 4.5 in. environmental enclosure and enclosure supply kit are included with the SDM8X50. Why doesn't the SDM8X50 make a clicking sound? The hermetically sealed relays used in the SDM8X50 are much quieter than the relays used with the retired SDMX50-series multiplexers. Although listening for the clicking on the SDMX50-series multiplexers was a common method to verify that the multiplexer was powered and communicating with the data logger, that test does not work for the SDM8X50. How does the SDM8X50 compare to the retired SDMX50-series multiplexers? The SDM8X50 is the same as the SDMX50SP in form, fit, and function. When purchased with the –E enclosure option, a 10 x 12 in. environmental enclosure is included, making it functionally the same as the SDMX50. 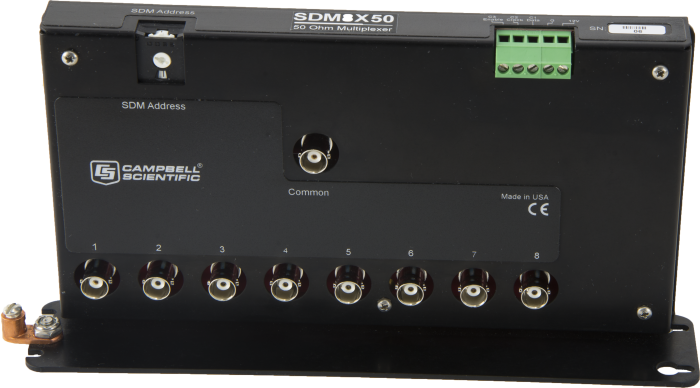 There is no comparable replacement for the SDMX50LP, which was the multiplexer and backplate used with the SDMX50 but sold separately for installation in a user-supplied enclosure. The primary difference between the SDM8X50 and the SDMX50-series multiplexers is the electromechanical relays. The SDMX50-series products used latching relays with an expected lifespan of 5 x 106 operations. Because these relays were always latched, there was always an electrical pathway back to the TDR100 and an increased risk of damage from an electrical surge. The SDM8X50 uses non-latching, hermetically sealed relays with a lifespan of 100 x 106 operations. Additionally, relays have been added to the ground channels to electrically isolate them from each other and reduce interference. 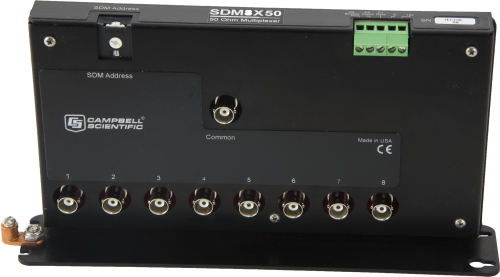 Thus, the SDM8X50 has improved surge protection, quieter operation, and a longer lifespan than the SDMX50-series multiplexers.